If you’re looking for the best personal budget template in Canada, you can download it here for free. It started off as a structured budgeting template, but it has evolved into more than just a template: it’s also now a budget calculator too. People tell us all the time it’s amazing, but that’s for you to decide. You can customize the template to suite your personal budgeting needs, and while you do this, it’s designed to make things as quick and easy as possible. Whether you love details or you’re more of a big picture type of person, this template has you covered. It has plenty for everyone. It’s an Excel based budget template spreadsheet designed by budgeting experts at the Credit Counselling Society. All expenses are grouped into 9 different categories: Housing Expenses, Utilities, Groceries, Transportation, Clothing, Medical, Personal Expenses, Savings, and Debt Payments. It provides comprehensive lists of personal expenses to choose from for each category. It visually shows how much you are spending in each spending category with a pie chart and bar graphs. It allows you to make any expense weekly, bi-weekly, semi-monthly, monthly, annually, and many other frequencies depending on the type of expense. The spreadsheet then does all the math for you and calculates everything on a monthly basis. This allows you to work with expenses as you relate to them, but it pulls everything together for you so you can easily see and manage the big picture. As you fill out your budget in each spending category, it guides you by suggesting a reasonable amount to spend in each category based on your financial situation. If you appear to be spending too much in a category, it will gently bring this to your attention. It offers a lot of tips as you create your personal budget on the template. Once you’re done, if you’d like to improve your budget, it can analyze your budget and look for dozens of ways to improve it. You can learn more about the features of this personal budget calculator template or you can just download it and try it out. It’s completely free to use. While this Excel template works perfectly as a personal budget, it can also quickly transform into a household or family budget for your home. Whatever you decide to do with it, this free, printable, monthly spreadsheet / worksheet will make your budget simple, easy to understand, and fun. 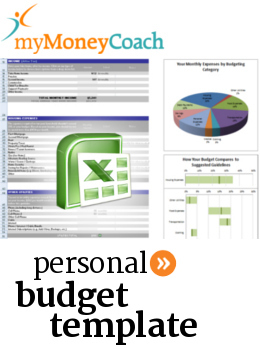 Give this personal budget template a try and see if it will work you. Most people find the added budget calculator features to be quite helpful as it gives them greater insights into how they’re using their money. The extra features also make it quite a bit more fun and interesting.